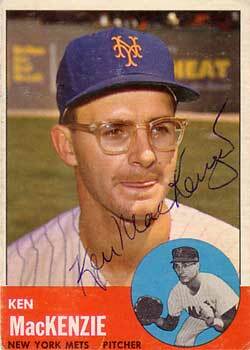 My other card came courtesy of former infielder Bobby Klaus, who played for the Mets in 1964 and 1965. After five season [sic] in the minors, Klaus made it to the bigs in 1964 with the Cincinnati Reds. A versatile infielder, he was sold to the New York Mets on 7/29/64 and finished his career there in ’65. In his two major-leauge seasons, Klaus batted .208 with six homers and 29 RBI. 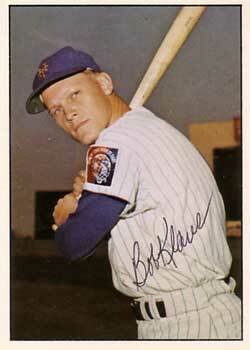 The younger brother of longtime major-league infielder Billy Klaus, Bobby batted .225 in ’64 and .191 in ’65. TCMA used a great photo of Klaus from 1964, prominently showing the World’s Fair uniform patch. He also has a nice, easily readable signature.